Knotted Cotton: Let's Get Acquainted! Today I'm one of the hosting blogs on Let's Get Acquainted Blog Hop Day. If you are visiting for the first time, hello, welcome and thank you for dropping in! I'm Catherine and live in Scotland with a husband, two children, a 15-year old cat, a goldfish and numerous clothes moths. I used to work in publishing but now I'm a happy gardener. How long have you been quilting? - My grandma taught me to do English paper piecing when I was little and I really got interested in patchwork again last year. I think having very small children is sometimes a bit like Groundhog Day, or the Dark Ages, and I disappeared into it and didn't do any making for a while! Now I'm trying to get back in the habit. Quilting tips - cut accurately, square up and press often. After that, everything is easy, haha! Blogging tips - Do reply to comments if you possibly can. When I first started blogging I didn't realise how nice it is to get a reply. Do try not to worry what other people think. Don't call a post Hooray for F*t Bot*om Girls as you attract some visitors via search engine who must be very disappointed to land on a quilting blog. Favourite fabric - I either get into them and then can't remember what I ever saw in them, or I don't realise how much I love and need them until they're gone. At the moment I really like plain linen. I have an embarrassingly small stash, because fabric is expensive and I tend to buy with a project in mind, but I don't feel too guilty for the occasional impulse buy because my husband is a technophile and his purchases are way more expensive than mine. Favourite craft book - actually bloggers are so generous with their knowledge that I have learned a lot and got a lot of inspiration from my favourite blogs. Sometimes I'm quite stubborn too and like trying to work stuff out, even if it means re-inventing the wheel. Thank you for taking the time to visit my blog - I hope you'll come again! :-) Please visit my hop-mate Sarah Lou, and finally a big thank you to Beth for organising the party. I swear that could have almost been written by me!! I buy fabric mainly for projects, although if I really love something and it's on sale I'll splurge a little ;) And ditto on the favorite book comment!! I thought you had hired assassins for the clothes moths! What a treasure box you found and some fun memories! Enjoy working on your hexagons. HI Catherine, nice to meet you. I totally agree with you about buying fabric just for projects. Sometimes when I find a good sale I would splurge little, but as you said fabric is expensive so it gets hard to build a stash in a short time. Great post! Is your blogging tip from personal experience?!? Happy Birthday to the lil helper! Great post! Hehe had to laugh at the Groundhog Day/Dark ages comment about kids. It definitely feels that way sometimes!! You've got some fab projects listed there! Catherine, this is a wonderful post! I know what you mean about fabric lines...I always waffle back and forth about buying ones I really love and then when I finally take the plunge, they're all gone! Your tutorial is great...such a clever project. Great to get to know you better! Nice to learn more about you Catherine :) And super mosaic - now you will need to tach me how to make that type! Love the mama and baby in the mosaic - I will have to search your blog for that to see it - it is amazinag!! Nice to learn more about you Catherine! Lovely to learn more about you Catherine and what a great and funny post! Happy birthday to your helper! Just stopping by on the Blog Hop. Nice to meet you Catherine and I love your tutorial! I might have to make one of those for my son. Too cute. Nice to meet you from the blog hop. I like your tutorial. Unfortunately my kids are too big now, but I could use it as a gift. Just stopping by on the hop. Completely hear what you're saying about small kids. Glad to know that eventually I'll have some time to sew again. Great stuff! So glad to meet you, I love all of your favorite projects up there. Great use of the crab fabric, I've been hoping to see some inspiration with that line! 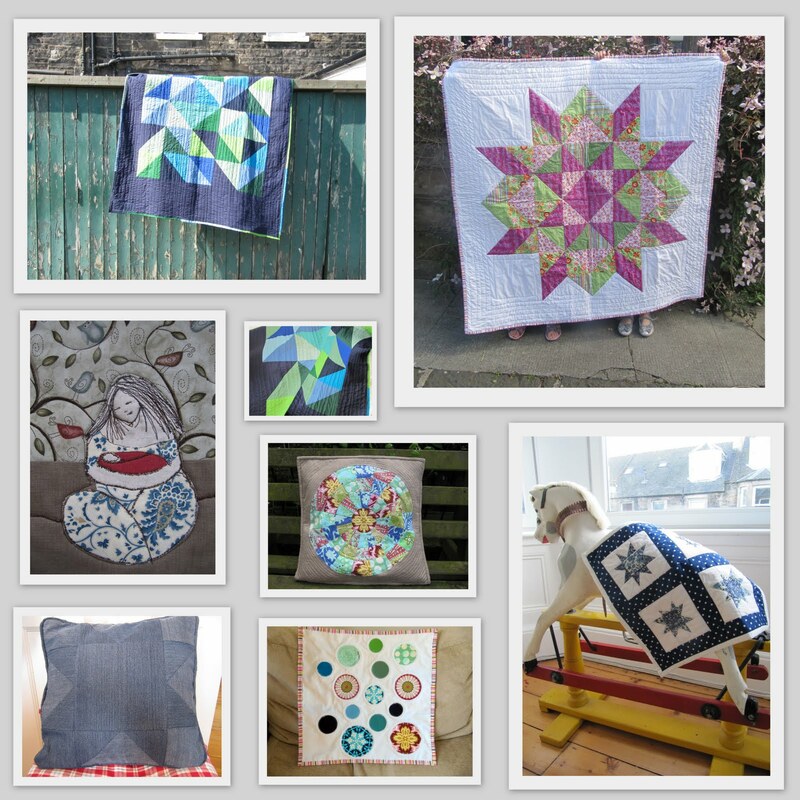 Love you mosaic of makes - gorgeous quilts! It's nice to get to know you better! Your mosaic is lovely and I like your blogging advice. I was thinking about calling a post 'how to look good naked' but perhaps I'd best go for 'rag dolls without wrinkles'...! Nice to meet you Catherine. I'm a tad late catching up on the latest blog hop posts. I so relate to your comment about the seam ripper. I actually broke my best one ripping out stitches. If only seam rippers worked as easily and quickly as rotary cutters.